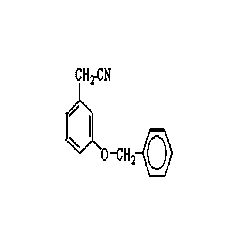 CAS No: [20967-96-8] Our clients can avail from us a highly effective range of 3-Benzyloxyphenylacetonitrile, which has mainly properties. These chemicals can easily retain their original properties, as we pack these in moisture proof polythene. The wide variety of chemicals offered by us finds extensive application in the dyes & chemicals industry across the globe. Our clients can avail from us a highly effective range of 3-Benzyloxyphenylacetonitrile, which has mainly properties. These chemicals can easily retain their original properties, as we pack these in moisture proof polythene. The wide variety of chemicals offered by us finds extensive application in the dyes & chemicals industry across the globe.